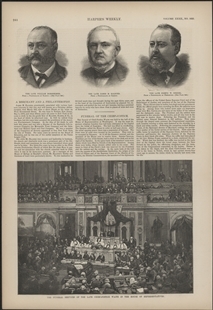 The House Chamber is shown during the funeral for Chief Justice Morrison Waite, whose unexpected death in 1888 created a sensation in the capital. 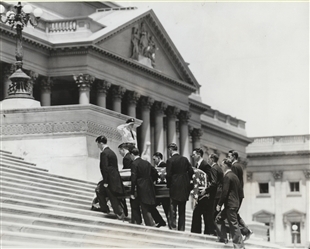 The accompanying article described the chamber as “filled to overflowing.” The coffin shared the area in front of the rostrum with the President and his cabinet, while in the main body of the room the remainder of official Washington was present. The print, likely made from a photograph, showed the Episcopal Bishop of Maryland conducting the service; one of many funerals that took place in the House in the 19th century.